Wheeled vehicles appeared at the turn between the 19th and 20th century. As is often the case with military innovations, the armies around the world reacted cautiously to this new invention, so they didn’t see action until World War I (also known as The Great War), and even then, the new tanks were the top priority after their introduction in 1916. 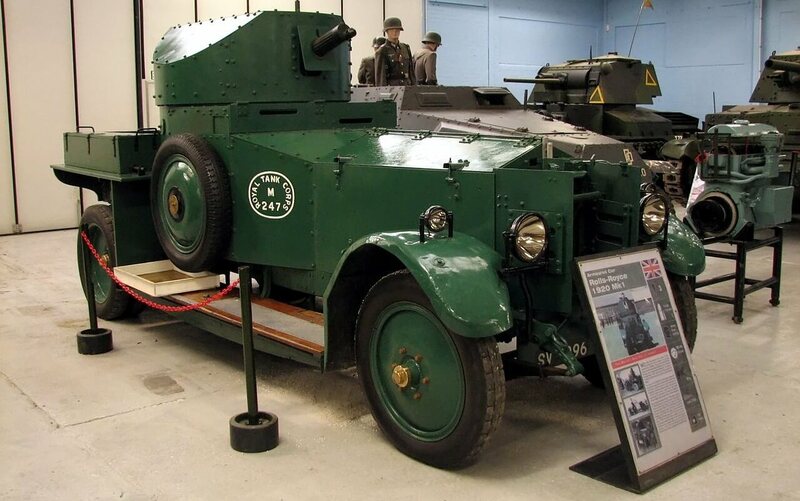 One of the first armoured cars was a variant of a civilian vehicle. For example, the United Kingdom turned the iconic Silver Ghostfrom Rolls-Royce into a combat vehicle, armed with a 7.7 mm machine gun, and its armour was only 8 to 9 mm thick. 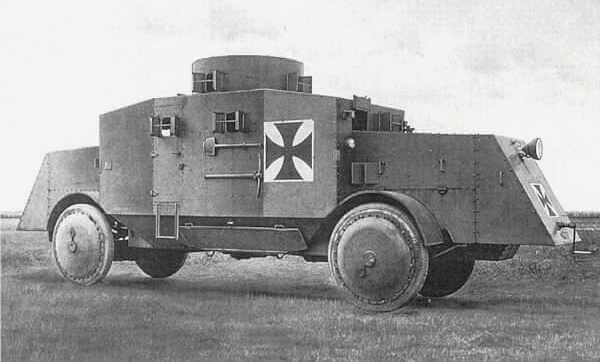 Facing those vehicles at the start of The Great War, Germany responded with the Büssing A5P, a large vehicle with no less than10 hatches for machine guns. But in the end, only three guns were permanently attached to it, whereas the rest had to be filled by a (10 men!) crew moving from one firehole to the other – not very reliable, right? Many countries tried to push for more armoured cars. However, because World War I was fought in trenches, tanks were the best option, as they could break through them. Additional drawbacks of these early vehicles were that they needed acceptable roads, chains to cross snow, and even… horses. Indeed, armoured cars had to be delivered by these animals to prolong the lifespan of their engines, and avoid making too much noise so that the enemy wouldn’t detect them. If The Great War hadn’t turned into a trench conflict, the armoured cars would have played a major role. But they had to wait 20 more years to shine as a concept. In 1939, the wheeled vehicles had clearer goals – for example, looking out for enemies – and more well-defined purposes. From a technical point of view, Germany’s and France’s armoured cars were the best at the time. The Panhard 178 was a powerful four-wheel drive (4WD) vehicle, equipped with two control posts and a 25 mm gun. Germany had its own 4WD vehicles, such as the Sd.Kfz.221, 222, and 223, and even bigger machines based on an 8×8 chassis. 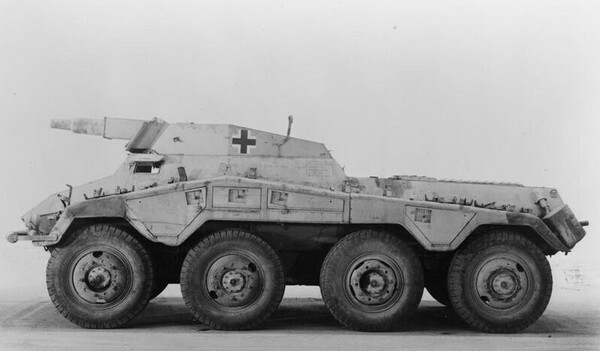 Armoured cars were so useful in this environment that the North-African front gave birth to a new class of wheeled vehicles, that we would call “wheeled tanks“. These machines were still manoeuvrable, but their weaponry was close to actual tanks. 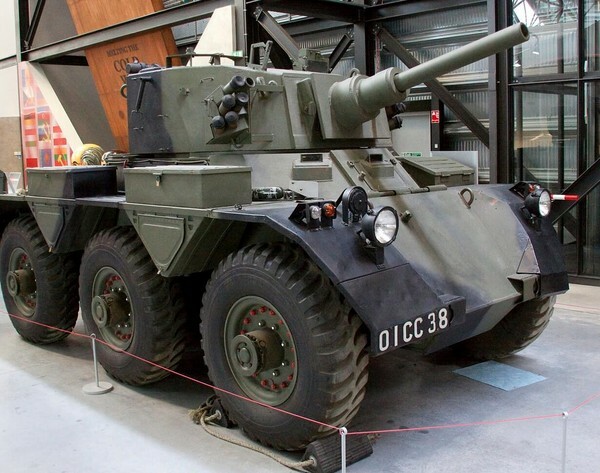 The British deployed the AEC as well as the T17E1, better known as Staghound. On the Axis side, the Sd.Kfz.234 family was developed for the desert and turned out effective enough to fight successfully across Europe. The results of World War II had different effects on the opposing nations. Even though armoured cars turned out to be quite useful during the conflict, not every nation was fully convinced. For example, the USA never developed “wheeled tanks”, and the concept of armoured cars itself remained quite understated for years. 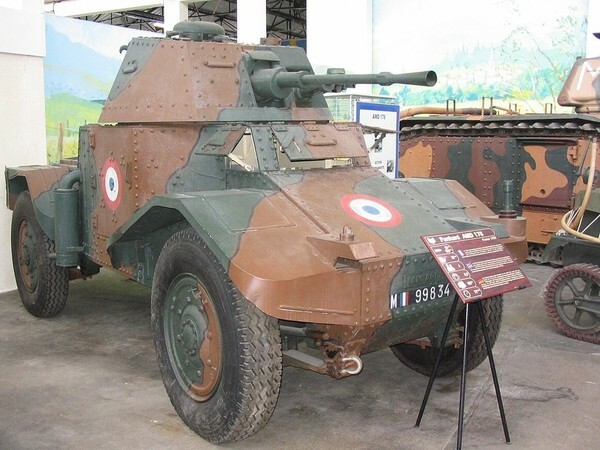 As a strong believer in armoured cars from the very beginning, France actually developed plenty of armoured cars, including vehicles close to the famous “wheeled tanks” like the Panhard EBR series, now available in our game! These are not armored cars. Armored car is just that, a car with some armor and sometimes an armament of some sorts. One difference between armored cars/trucks and dedicated armored vehicles is that armored cars/trucks have armor but are designed around unarmored vehicles; steel or aluminum plated, yes, but ultimately makeshift. The Russian BA-3/6 and German Sd.Kfz.231 (the six wheeled one), for example, have their chassis based on unarmored trucks. On the other hand, dedicated armored vehicles often boast specially designed chassis, like the Sd.Kfz.234 or many of the postwar designs. I do not quite know if we really need more wheeled vehicles in the game. On the one hand it is not a good solution if only the french have some, on the other side i do not want to imagine what it looks like if 4-6 of them are in one match per side, especially in the hightier. I mean, are there not enough Tanks in the world with unique features that are waiting to be implemented into the game? You rarely see more than 3 lights every battle. So they won’t increase the number of lights in battles, but will make lights more diverse. on the dark side, wheeled tanks are quite pathetic and a massive handicap to any team on most maps, due to WG creating corridor, HT choke points, static features such as large rocks or buildings in the middle of nowhere, in an attempt to permit harder camping, for protection from SPGs and invisible TDs. I personally played some 30 battles in test, and every single map was one of the more open field, free to unleash the full speed, turning and potential of the tyre tanks we were testing. Not once did I get a city map. So far in live game, only city maps, corridors, camping. Oh and the now consistent 350+ in battle ping, with such beautiful lag that comes with it, on HK server. Even drove off a cliff, before I knew I had done it, in one game. From what I see in battle, the french tyre tanks are more a gimmick sales plan than anything, and not very popular. They absolutely must be always moving, at full speed, and there aren’t many maps that allow this, without being restricted to a small confined space. Please if going to retain over 300 ping and lag, making game unplayable, allow us to transfer to EU or RU, as lag and ping is better there….as per test server.